Pete is a commercial fisherman and wondered if he couldn't save money by making the Rumford (which he irreverently calls a "Rumpert") throat out of 1/4" steel. He knows some boat builders who could do that. I told him that was NOT a good idea. The steel would expand and warp and anyway be even more expensive. I lived in a boat building community, I told him, and so far I haven't gotten any support for my idea of building a catamaran out of sewer pipe. Pete liked that and switched from steel to pouring his own cheap concrete throat to save money. We were all full of hope. And came out of our coats. Could be heard from us all. In all honesty, I doubt that my version works as well as yours. I've spent a lot of time watching the smoking lower ends of logs set in tee pee fashion, and blowing cigarette smoke at the fire box. I do have some turbulence right at the bottom edge of the throat that I don't think should be there. 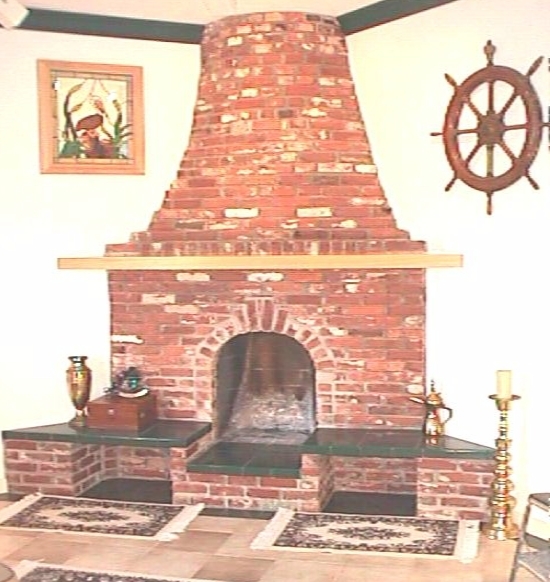 I think this is probably due to the fact that we built an arch that did two things: it set the throat four inches back into the fire box, (The drawing that came with the damper showed this being done, but with segmented throat pieces.) and it also created a pocket between the arch and throat at each upper corner. Peeta and I argued about this for hours. Being a pilot, I was spouting phrases about laminar flow & Bernoulli's Principal while Peeta kept saying we weren't building an airplane; while I insisted that for all practical purposes, we were. I was so afraid it wouldn't work that I called a halt once the arch was built, and before the facial bricks on each side were laid. We built a fire the next day, and it seemed to work ok, Had it not, we could have knocked the arch down and done something else. We faired in the pockets that I mentioned with mortar containing a healthy dose of Superior Clay clay, but I do have some smoke patterns on the throat out towards the sides. But not all the way to the front. The other potential problem was the throat itself. I cast the curved portion as a rectangular slab 28 inches wide with the curve on one side, but flat on the front side, thinking the extra thickness would add strength. I allowed for a top lip width the same as the Superior Clay flu pipes that we were cutting up to create the other three sides. However, since the front side of the slab immediately started getting thicker, that lip was wedge shaped and would not fit into the damper properly. I had intended to use the diamond-bladed Skillsaw to remedy that problem by making a shallow cut on the front side of the slab and chipping away the excess. In the meantime, Peeta was cutting the side pieces out of flu pipe, and since I had not voiced my intentions to him, he took it upon himself to remedy the problem by making up for the error in the side pieces. Everything fit nicely into the damper at this point, except the back edge of the throat protruded a half inch into the damper opening. Before I could say whoa, he'd fixed that problem by whacking the edge of the throat with his mason's hammer a few times, and the lip was gone. At that point mortar was ready to kick in the wheelbarrow, we were a three hour drive from getting another flu pipe to cut up, and a day away from casting another slab. I got weak, and said ok, let's go on with it. So... The synopsis is thus: Yes, you can do it yourself. The second one you do yourself would probably be right on the money as long as you keep your eye on your Dutch mason who throws bricks around so fast it's a blur. You can save 50% of material costs by doing it yourself, but you'd better have a lot of time available, and all the right tools. And you'd better know how to use them, because cutting an inside curve in flue pipe with a Skillsaw is no easy task. As long as you've got a real job and aren't a poor commercial fisherman, spend the money with Buckley. 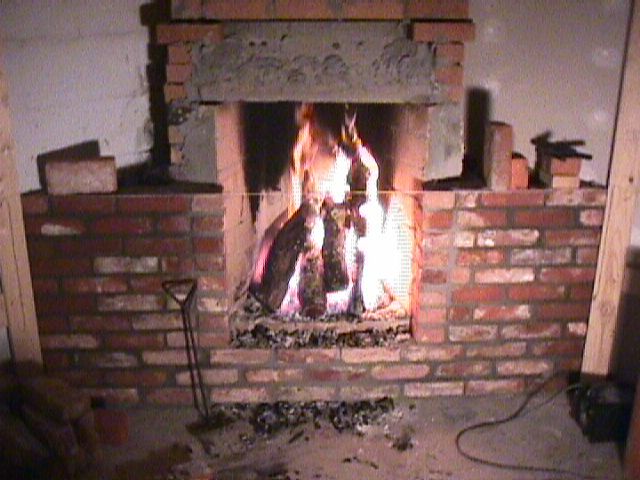 We're still casting slabs for the hearth, and waiting for me to come up with a mantle prior to finishing the facial bricks. I'll send along some pics when it's complete.